A self-contained introduction to everything that is needed to use Python for science, from the language itself, to numerical computing or plotting. Tutorials on the scientific Python ecosystem: a quick introduction to central tools and techniques. The different chapters each correspond to a 1 to 2 hours course with increasing level of expertise, from beginner to expert. 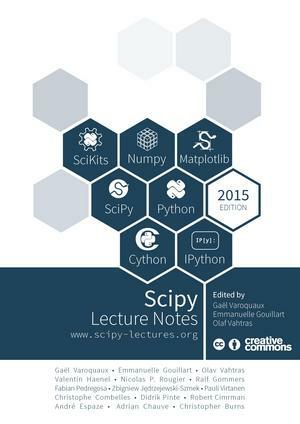 Scientific computing with tools and workflow - The Python language - NumPy: creating and manipulating numerical data - Matplotlib: plotting - Scipy : high-level scientific computing - Getting help and finding documentation - Advanced Python Constructs - Advanced Numpy - Debugging code - Optimizing code - Sparse Matrices in SciPy - Image manipulation and processing using Numpy and Scipy - Mathematical optimization: finding minima of functions - Interfacing with C - Statistics in Python - Sympy : Symbolic Mathematics in Python - Scikit-image: image processing - Traits: building interactive dialogs - 3D plotting with Mayavi - scikit-learn: machine learning in Python.